Rs.500 and Rs.1000 Notes are banned, Rs.500 Are Banned, Rs.1000 Are Banned From 12 PM 9th November 2016, How To Exchange 1000 500 Old Notes. The Prime Minister of India Mr. Narendra Modi take a biggest decision against the Black Money and Corruption and announced Rs.1000 and Rs.500 notes are banned. India Government only banned Rs.1000 and Rs.500 notes only. Rs.10, Rs.50 and Rs.100 notes are legal. Don’t worry if you are unable to exchange currency within 30th December. you can change currency at Reserve Bank Of India within 31st March 2017 with your Valid PAn Card and Identity. 2. Ask them to exchange form, they will give you a form below given. 3. Fill the Old Note Exchange Form and enter exchange amount Rs.4000 only. ATM withdraw limit will be Rs.2000 per day till 24th November and after it you can redeem Rs.10,00 per day and Rs.20,000 per week. There are many way to exchange your Old Currency with New Currency in any bank. Those peoples who have their own bank account they can deposit Maximum Rs.50,000 per day in Bank account with valid KYC documents. You can exchange your old Rs.500 and Rs.1000 with new currency as Rs.4000 per day till 24th November 2016. From 11th Nov to 24th Nov ATM withdraw limit is Rs.2000/day only. and from bank withdraw the limit is Rs.10,000 per day and Rs.20,000 per week only. 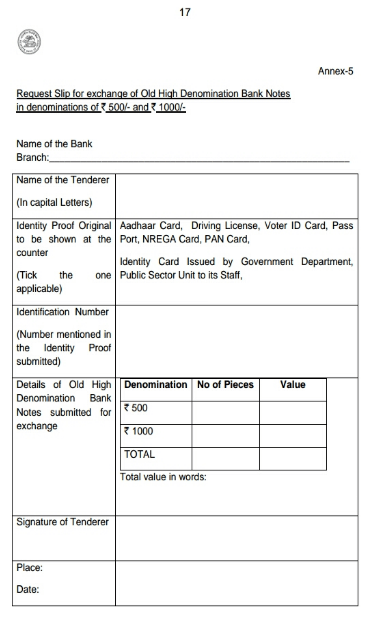 Tags – Rs.500 and Rs.1000 Notes are banned, Rs.500 Are Banned, Rs.1000 Are Banned From 12 PM 9th November 2016, How To Exchange 1000 500 Old Notes.